The beer’s label is funky and old-timey in look. I like the fonts and the ‘scuffed’ look of everything. The coloring is old, rusty, and reminiscent of the desert. Clutter is slight on the label, but not awful. The overall layout and “text-art” feel of it is great. This is a rare bottle with visual aesthetic beauty. It’s worth keeping on a shelf. The beer pours a beautiful golden orange with a huge head of large, pebble-like bubbles. The head settles to a half-finger’s width height above the beer and then slowly fizzles away with mediocre retention. In body, the beer is opaque and murky, yet gorgeously bright in color with lots of lively carbonation bubbles running through the glass. On the nose, the beer has a grassy barnyard funk. It is not an overpowering funk, but is gentle and complex. Hay, soft cherry, prickly horse blanket, and fruit leather tickle over the nostrils. 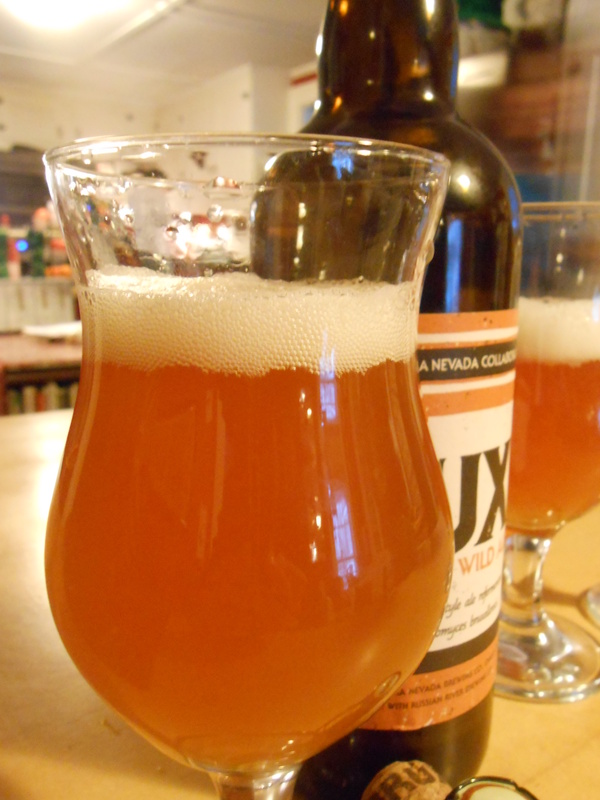 On the tongue, the beer tastes initially lightly tart with acidity and a funky sweetness. This dries into the finish with a touch of salinity and grassy bitters. In flavor, this beer shows many similarities to a nice gueuze, which I like, but it loses that on the finish. Bright lime and lemon peel flavors blend with subtle cherry, barnyard funk, and a touch of metallic copper. The middle of the sip develops an odd meatiness, while the finish places a splash of pineapple, slight earthy salt, and must alongside grassy bitters. In the mouth, the beer feels on the light side of medium in body with a fierce and fizzy carbonation and a crisp, snappy, and slightly slimy mouthfeel. The tongue is left tingly with acidity and the cheeks fill up with spittle, yet the mouth as a whole feels dry. Overall, this is a nice funky beer, though I wish I had aged it for a couple more months. The nose is superbly funky, almost like a well-crafted gueuze but the flavor doesn’t quite stand up. The meatiness develops more and more as the beer warms, which is too bad, and the funky flavors aren’t quite there yet. This beer is good, and has some awesome parts but doesn’t quite add up as a whole yet. A good beer, but if you have a bottle, age it longer. P.S. 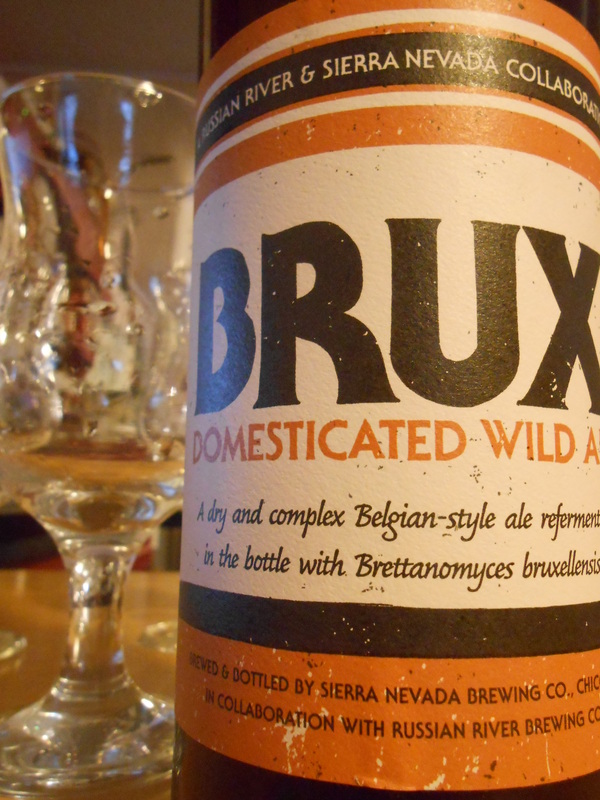 If you do have a bottle and are wondering when it will be good, go check out the wonderful “Brux Project” on I Think About Beer. 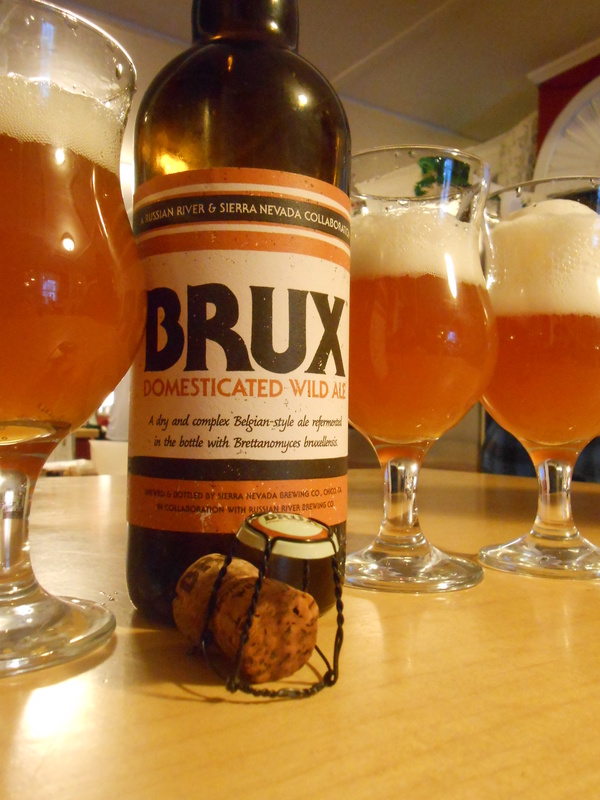 It’s a great blog that happens to have a whole case of Brux and is popping one every 6 months or so to let us know how it is aging.